Howdy. I picked up a 1984 Chevy K10 about a year ago and one day it'll be worthy of some off-roading (still getting it good at on-roading right now). Thought I'd drop by and introduce myself. If anyone's in the area I'm easy to pick out, just look for the mix-matched colors and listen for the terrible exhaust leak. Welcome to offroadsc! What are your plans for it? I just finished rebuilding the axles and putting in a little lower gears. My plans are front and rear lunchbox lockers, 33's and a 4" lift. I want an off-road capable rig that I can still drive around town without hating it. Tube doors for the summers since I don't have A/C. One day in the distant future I'm going to pull the 305ci and drop in a crate 350ci. I bought it for the sole purpose of having a project that I could have some fun with. 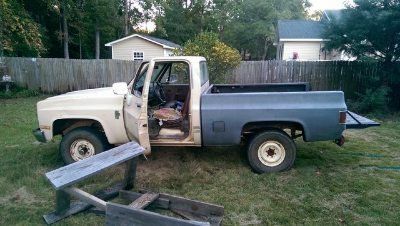 I'm not sure what it'll look like in the end, I just always wanted a manual trans, single cab, 1/2ton. Nice! There are two guys that pop in from time to time that are Chevy gurus. Sam and Jeff. Those are awesome old trucks. sounds like a cool plan, I agree I love a Single cab manual trans full size truck. I always thought one of the dodge half tons would be fun in that configuration. Nice to see someone from this side of the state! I'm over in Hartsville. When you get ready to test it out give me a shout. I know a guy that has a trail loop with obstacles on it right outside Bishopville. GL! Keep us posted. If you ever end up over here give me a shout and stop by! Sweet, living on the freaking coastal plane means it's hard to find anywhere good to ride. I now regret not doing this while I was living in the upstate. I work in Darlington, so I'm over that way pretty often. I'll shoot you a message.